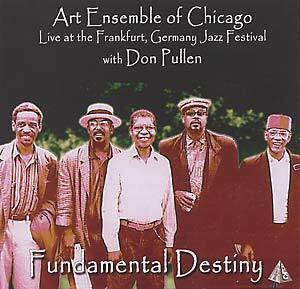 ...Live at the Frankfurt, Germany Jazz Festival with Don Pullen. "Now, the production team at AECO has once more gone through the archives and come up with another gem, culminating in the recent release of Fundamental Destiny, a record of a live 1991 Art Ensemble concert given in early June of that year at the Frankfurt, Germany Jazz Festival. All the members of the ensemble are present: Lester Bowie on trumpet, Joseph Jarman on woodwinds and percussion, Roscoe Mitchell on woodwinds and percussion, Malachi Favors Moghostut playing both bowed and pizzicato bass and percussion, and Famoudou on drums and percussion. What makes this release all the more special is that, like Kabalaba and The Chicago Blues Tradition, they invited a renowned keyboard artist to perform with them, in this case the late Don Pullen. He adds another group of ideas to the already interesting chordal landscape of the four compositions. Plus, there is that ever-present life energy of the band that he compliments, especially on his solo on the Joseph Jarman-penned title track."